The eLearning Infographic Group have been doing some pretty great work creating info graphics. I submit that infographic are a form of mapping. IMHO, mapping is a great learning and retention strategy. You can check out my blog post on mapping here. I have found that for me, the best way to find out the strengths, weakness, and keys to implementing a strategy is to try it out. Therefore, I have tried to consolidate my Instructional Design posts into an infographic and offer it to you for your viewing pleasure, and any constructive feedback you would care to offer. Extremely valuable article and great infographic! We will share it across eLearning Industry's network. Submit and promote your infographics for free! This infographic is very helpful. As I'm typing this comment, we are discussing this infographic in a workshop in Windhoek, Namibia. 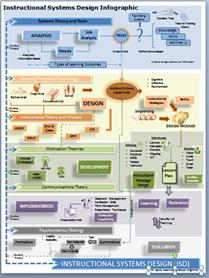 I am teaching a graduate course this term (fall 2017) on instructional systems design and was hoping I could use your ISD Infographic? I realize the image is copyright protected and will certainly including this information. Are there any other restrictions on use of your infographic that I should be aware of? Thanks for your time.